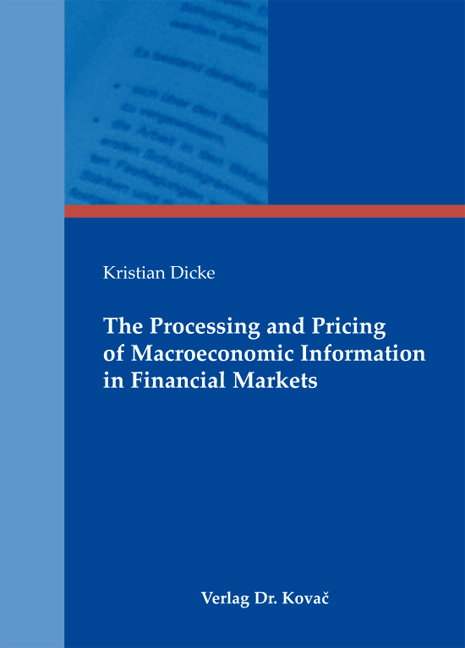 The Processing and Pricing of Macroeconomic Information in Financial Markets. Doktorarbeit von Kristian Dicke, Verlag Dr. Kovač 2013, 170 S.
How is macroeconomic information processed and priced in financial markets? This work is dedicated to the exploration of different aspects of the relationship between the macroeconomic state of an economy, information about this state, and the pricing of assets. The research question is addressed in three steps. First, we explore the sensitivity of investors’ risk premium demands to macroeconomic risk. Specifically, we analyze the link between an economy’s macroeconomic situation and investors’ equity risk premium demands. Our approach to exploring the relationship between business conditions and risk premia expectations is unique: We proxy investors’ risk premium demands using implied risk premia. This approach allows us to derive risk premia expectations at one point in time from a data set that was available to investors at that point in time. We demonstrate that macroeconomic risk has a huge impact on equity markets. Overall, a set of six different macroeconomic risk factors explains more than 60% of the time-series variation in implied risk premia. Second, we ask how growth- and inflation-related news impact stock and bond markets. Specifically, we analyze the difference in risk premium on the release dates of macroeconomic announcements, depending on if a macroeconomic announcement primarily informs investors about GDP growth or inflation. We find macroeconomic information to be awarded a risk premium depending on its underlying content. We show that both stocks and bonds earn substantial excess returns on days when macroeconomic reports are released. However, not all announcements affect stock and bond markets in the same way. Stock investors earn a risk premium on days when news about GDP growth is released, while bond investors are compensated for bearing the risk of inflation-related news. Finally, we study how investors could process time series data on individual macroeconomic indicators efficiently. The revised value of macroeconomic indicators usually deviates from the initial announcement. Investors can anticipate this revision to some extent.